If you have been following a training plan for a race, especially a half or full marathon, you likely noticed that the week or two before the race calls for less mileage and shorter workouts. The decrease in training volume (how many miles you run in a week) and intensity (how hard your runs are) is called tapering. Tapering before a race serves as a culmination of your training to prepare you for your quickly approaching race day. It may be tempting to add in a missed long run or one extra speed workout to test your fitness, but doing either of these would be detrimental and could negatively affect your race performance. After all that training, you want to be able to do your best on race day! Tapering helps you focus on recovery and sharpening in order to maximize your training and be best prepared for race day. Why do you taper instead of trying to improve your fitness in the last two weeks before a race? Research shows that tapering can improve your race performance anywhere from 0.5%-6%; most runners will see a 2-3% increase in performance! To translate that into race times, if your previous race times and training indicate that you are in shape for a running a 1:51 half-marathon (8:28/mile average pace), you may be able to run a 1:48 half-marathon (8:14/mile average pace). That’s a big difference! Most obviously, you see a big difference in your running after tapering because your legs are rested and less fatigued than they were throughout the training cycle. Tapering also increases the amount of glycogen available for your muscles. Glycogen is what powers your muscles, especially during endurance events, so essentially tapering is adding extra fuel to your muscles. 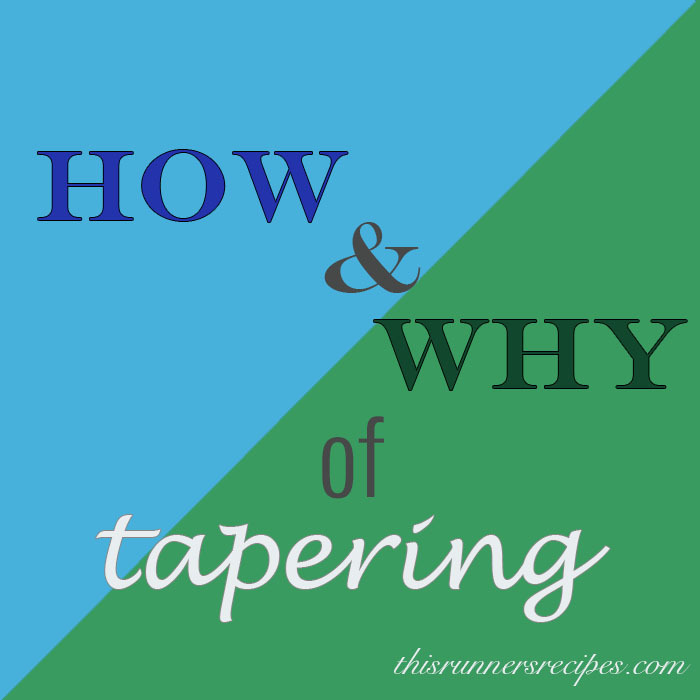 You don’t want to stop running or run too little during your tapering. Too much rest can leave your legs feel sluggish because of a lowering in muscle tension. Additionally, too much rest can throw you out of your routine, which can make you feel off both physically and mentally. While you want to reduce your overall mileage, you want to run the same number of days; if you ran five days a week throughout the whole training cycle, then run five days the week of the race (including the race). You don’t want to exhaust yourself with grueling intervals during the taper period, but you want to maintain some intensity to keep your body feeling primed for racing. How much you reduce your mileage and your intensity during the taper period depends on how your body recovers from hard runs and how much you were running during the majority of your training. Some runners will only decrease their mileage around 80-90% of what they did for their training; others will cut their mileage in half. As you become an experienced racer, you will learn how much mileage during the taper period leaves you rested but not sluggish. Many runners will find that they benefit from skipping strength training during the week of the race, especially if they frequently do lots of leg exercises. Squats, lunges, and bridges can work wonders for developing strength and stamina in runners, but you want to avoid excess fatigue in your legs during the race. Some studies show that it is best to cut out lower-body strength training up to 14 days before the race, especially if you are aiming for a PR. Also consider cutting out any cross-training, such as swimming and cycling. Gentle yoga, however, may be beneficial a few days before a race if it helps loosen your muscles. Determine whether or not to do any yoga or other cross-training by how it made you feel on runs in your training. Nutrition and sleep play significant roles in recovery during your training, and this applies as well to your taper. Aim to get eight or more hours of sleep each night in the week leading up to the race, as sleep is vital to full recovery. In terms of food, you want to strike a balance of eating nutrient-rich and carbohydrate-rich foods while avoiding foods that can cause GI distress. Even though you are working out less than normal, don’t reduce the number of calories you consume each day, because you want to store up lots of fuel in your muscles. Consume more carbohydrates by progressively increasing the percentage of your calories that come from carbs. You don’t want to largely increase your overall calorie consumption, as this can lead to unwanted weight gain. Do anticipate the possibility of gaining a temporary and small amount of water weight as you carbo-load; your muscles are filling themselves with water and fuel for the race. Finally, use the extra time in your taper period to reflect back on your training. This will help you prepare mentally for the race. Look back over your training log and recall the difficult workouts that you struggled to finish; these will remind you that you have the strength to keep going even when you feel like quitting. Also focus on the runs that went really well, especially any speed or tempo workouts where you surprised yourself with how fast you were able to go. This will boost your confidence for race day. Don’t beat yourself up over missed or shortened runs; looking back over your training will emphasize how much you have done, not what you did not do. By: Laura NorrisFiled under Racing, Running, Tips. Tagged marathon training, Racing, running, Tapering, Tips. Bookmark the permalink.